SUPERSIZED SHARK WEEK IS HERE! Blue Planet Aquarium is going shark crazy over the May Half Term Holidays (May 28th – June 5th). 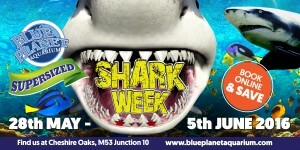 ‘Supersized Shark Week’ aims to be Cheshire Oaks’ aquarium’s biggest ever celebration of all things shark-related. There will be an all-new Shark Science Lab with daily live demonstrations and interactive shows, special shark events and activities in the Aquatheatre, and regular dive shows and feeds in the giant 3.8-million-litre Caribbean Reef display. With its 70-metre-long underwater moving walkway, the spectacular display is home to one of the largest shark collections in Europe; including three-metre-long sand tiger and nurse sharks, lemon sharks, black and white tip reef sharks, zebra sharks and guitar sharks. Blue Planet Aquarium’s Phil Jones said: “The world of sharks has fascinated people for centuries. “This event gives us the opportunity to explore lots of the most intriguing and exciting aspects of the oceans’ ultimate predators; from newborn baby sharks to some true giants of the deep. “Visitors will be able to really get to know these often misunderstood creatures with an action-packed programme of shark-related activities,” he added. To mark the event, the aquarium is also unveiling its brand new Shark Nursery. Made from a combination of recycled wood with a semi-circular viewing window, the nursery is home to more than 50 newborn catsharks, along with dozens of egg-cases with tiny, unborn sharks wriggling inside. As part of the fun visitors will be able to take their own selfies inside the gigantic jaws of a prehistoric megalodon shark, with a family pass on offer for the best pic and there will also be the chance to dig for shark teeth and fossils.